Americans are tapping into a widening network of both online and offline sources. The landscape has changed significantly since the spring of 2000, when 46% of American adults had access to the internet, 5% of U.S. households had broadband connections, and 25% of American adults looked online for health information. 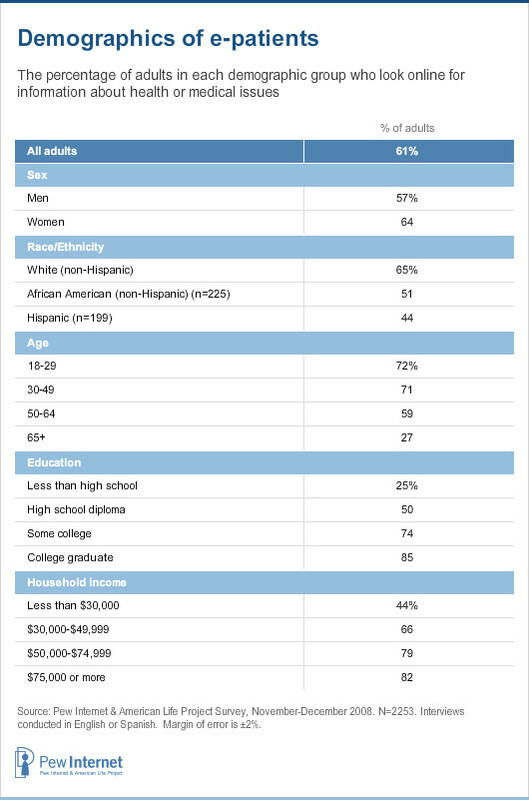 Now 74% of American adults go online, 57% of American households are connected via broadband and 61% of adults look online for health information. Further, many American adults now have an “always present” connection via wireless devices. Mobile access is changing the behavior of internet users and, in particular, changing the behavior of health care consumers. The mobile internet draws people into conversations about health as much as online tools enable research. The Pew Internet Project has mapped this landscape by asking American adults about their assets, actions, and attitudes related to internet and communications technology.7 It turns out that 39% of adults are Motivated by Mobility. If they have a desktop computer, they use wireless technology not as a replacement, but as a supplement to that “wireline” connection. Mobile access creates a continual information exchange that feeds on itself and reinforces collaborative behavior. By contrast, 61% of adults are the Stationary Media Majority. Many are on the “have” side of the so-called digital divide. They may have broadband and they may have a cell phone, but they are rooted in old media. They are just not that into the hive mind enabled by always-connected technologies such as Facebook, YouTube, Twitter, and the like. The Project’s December 2008 survey, conducted in partnership with the California HealthCare Foundation, brings together two other streams of our research: Americans’ use of social media and their pursuit of health information. But more importantly, this survey finds that Americans’ pursuit of health takes place within a widening network of both online and offline sources. The internet supplements, but does not replace, traditional sources of health information. The vast majority of people with a health question or concern say they consult a health professional. The second most popular choice is to ask friends and family. 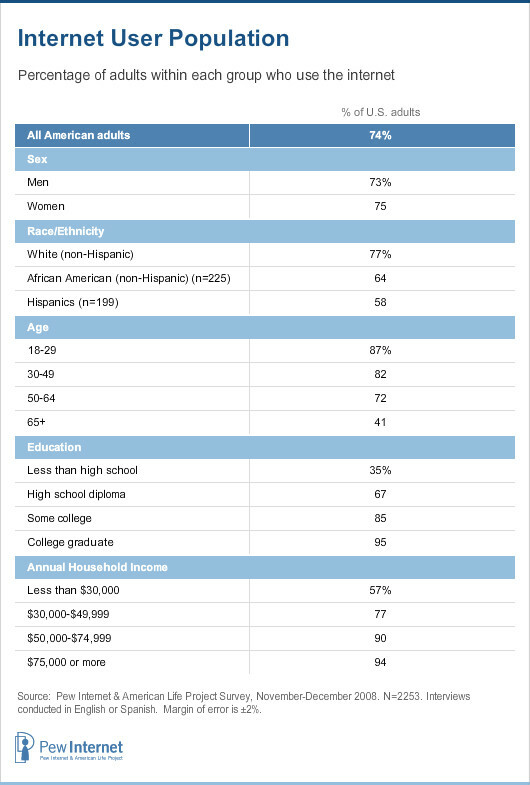 The internet and books, or other printed reference materials, are essentially tied at third place among U.S. adults who need information or assistance dealing with health or medical issues. Looking closer at how people use the internet for health care, it is clear that some are going online to connect, in fact, with what we think of as traditional sources: health professionals, friends, and families. People tap into their social networks, both online and offline. Whereas someone may have in the past called a health professional, their Mom, or a good friend, they now are also reading blogs, listening to podcasts, updating their social network profile, and posting comments. And many people, once they find health information online, talk with someone about it offline. This Pew Internet/California HealthCare survey finds that technology is not an end, but a means to accelerate the pace of discovery, widen social networks, and sharpen the questions someone might ask when they do get to talk to a health professional. Technology can help to enable the human connection in health care and the internet is turning up the information network’s volume. 61% of adults in the U.S. gather health information online. Three-quarters of American adults, age 18 and older, have access to the internet, a percentage which held steady throughout 2008. 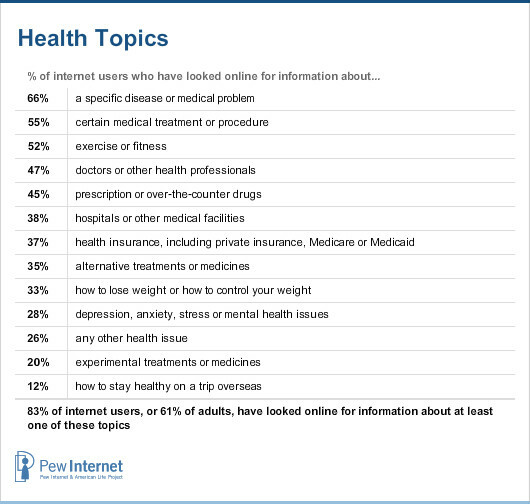 83% of internet users, or 61% of U.S. adults, have looked online for information about any of the health topics we ask about, ranging from information about a specific disease, a certain treatment, alternative medicine, health insurance, doctors, hospitals, and ways to stay healthy. 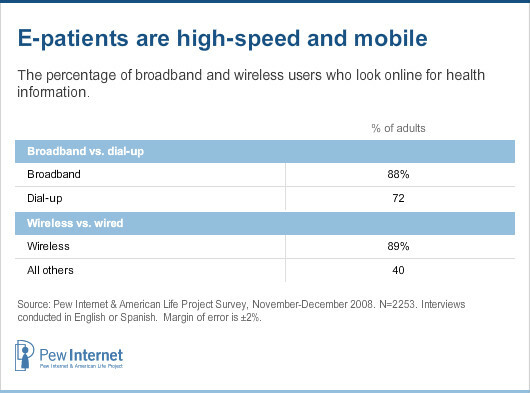 Internet users with home broadband or wireless access are more likely than dial-up and tethered internet users to look online for health information. The internet does not replace health professionals. Significant differences emerge between age groups, a finding that holds steady when controlling the other variables. For example, adults between the ages of 18 and 29 are significantly less likely than older adults to consult a health professional (79%, compared with 88% of 30-49s, 89% of 50-64s, and 89% of 65+). Younger adults are more likely than older adults to consult a friend or family member. Seventy-eight percent of adults ages 18-29 and 72% of 30-49 year-olds consult a friend or family member, compared with 58% of 50-64 year-olds and 59% of adults age 65 and older. The Center for Studying Health System Change recorded significant differences in health-information seeking behavior among adults with various levels of education.9 This survey echoes those findings: 94% of college graduates consult a health professional, for example, compared with 83% of high school graduates. Seventy-five percent of college graduates consult friends and family members, compared with 66% of high school graduates. There are no significant differences between adults who have dial-up internet access vs. those with home broadband; adults who report good health vs. those in poor health; and adults living in urban, suburban, or rural communities. All of these groups turn in equal numbers to health professionals, friends, family members, the internet, and other sources of health information. In conclusion, access to the internet does not seem to diminish Americans’ interest in talking with health professionals, friends, or family members. But the kinds of health information sought and found online are different from what people can glean from most traditional sources.